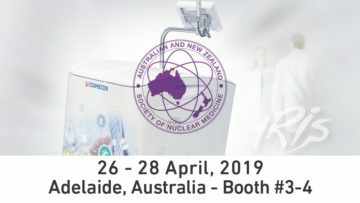 Comecer is exhibiting at the 49th Annual Scientific Meeting of the Australian and New Zealand Society of Nuclear Medicine (ANZSNM) happening at the Adelaide Convention Centre, located centrally in the city of Adelaide, Australia, 26 – 28 April 2019. We will exhibit with our partner GMS in booths 3 and 4 and present our latest solutions for your Nuclear Medicine department. 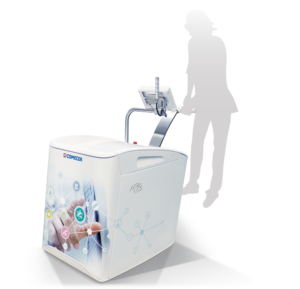 An IRIS automated multidose injection system, so you can see for yourself how easy it is to handle, thanks to its innovative design and autonomous battery power. This radiopharmaceutical injector performs calibrated injections to patients, starting from a multi-dose solution of FDG or other radiopharmaceuticals. Francesco Sergi will explain in detail the features and benefits of Iris and where in Australia it is in operation. A workstation and a specialist who can demonstrate our software platform for nuclear medicine departments: IBC NM Nuclear Medicine Management software. It is used primarily for quality control, lab management and validation. A major reference to share with you: the large and new SAHMRI (South Australia Health and Medical Research Institute) in Adelaide has our newest equipment, including the ALCEO Solid Target Processing System (read and download e-poster of our ALCEO research work with SAHMRI). Your copy of our latest radiopharma brochures and catalogue to take away.